Coconut milk is easy to extract at home. It is commonly used in many Indian dishes. I find it extremely difficult to write the procedure on how to prepare coconut milk from grated coconut every time I post recipes using coconut milk. So I decided to make a separate post on it. 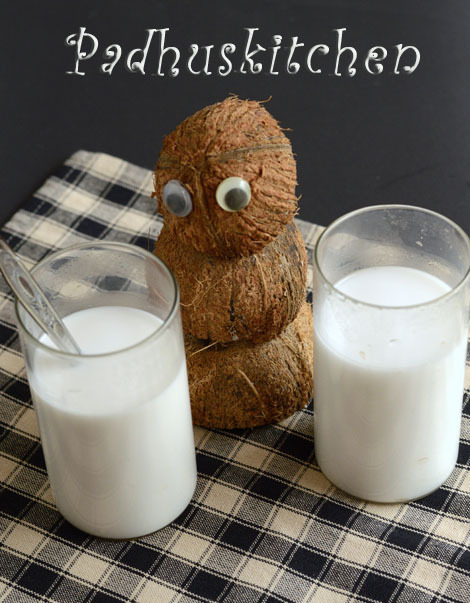 The good thing is homemade coconut milk is free of preservatives. Learn how to prepare coconut milk at home from fresh coconut. Break a medium sized coconut and grate it. First take 1 1/2 cup of grated coconut and grind it for a few seconds. Then add 1 cup of warm water and grind it nicely. Strain the ground coconut using a strainer. You can even use tea strainer or a colander lined with a soft cotton cloth or cheesecloth. I lined my strainer with a soft cotton cloth and then strained the ground coconut. Press it with a ladle or squeeze to extract as much milk as possible. The coconut milk extracted is the first milk or the first extract. (onnam pal). It will be thick. Keep this first extracted milk aside. Now add 1 more cup of warm water to the already ground coconut and grind it again nicely. Again strain the ground coconut with a strainer.The milk extracted now is the second extract/second milk (rendam pal or second milk) which is thinner than the first. I extracted it 2 times and got the first thick coconut milk and the second thin coconut milk. The glass with a spoon (in the picture above) is the thick coconut milk and the other one is thin coconut milk. You can add more water and grind the already ground coconut and extract the third milk which is even more thinner than the second milk. Hope you found this post useful. Don’t forget to hit the +1, Share,Tweet button, if you like the post.You can follow us on Google Plus, Pinterest, Twitter, Facebook and Subscribe to RSS Feed to receive latest updates. Thanks for all your recipes. Today i tried your vegetable korma and yesterday it was puliogare. Both came out very well. I was not too fond of cooking, but after finding your blog, i look forward to cook! Thank you so much! Your recipes are awesome, and comes out very well and tastes delicious. Thanks to you. Your blog is the best. You will get it in big department stores like walmart . You can even use clean cotton dupatta or handkerchief (kept aside specially for this) for straining. hi we can still use the remaining coconut in any curry or so right??? No, you have to discard it as you will have nothing in it. I appreciate your blog. Found it to be very informative, down to earth and practical. 1. Can we store this like regular milk in fridge for a couple of days ? 2. Is it ok to heat this milk like regular milk ? You can store it in a container with a tight fitting lid for 2 days. You you can freeze it for more than a month. Yes, you can heat it or boil it lightly. It does not taste good with tea. But I make porridge with coconut milk and add dates for sweetness. It taste awesome. You can also try my ulundu kanji with coconut milk. Type Ulundu kanji in the search box on the right top of the website.